It’s Monday and that means there is a new Binweevils Dip’s Monday Challenge to get a Free Binweevils Code! There are several parts to this Binweevils Challenge so lets get started with the first and work our way down! Look at the pictures to spot the differences. How many differences do you see between the two pictures? You should have noticed that there are a total of 5 differences! 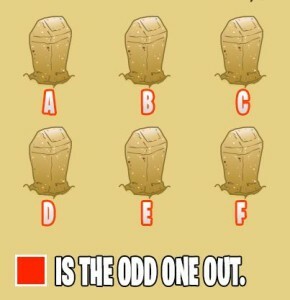 Now for the next part of the Binweevils code you need to find out which Sand Bin is the odd one out. As you should be able to tell, letter “D” is the odd one out! So now we have two parts to the code! The next thing you need to do is complete the crossword puzzle which we are not going to do for you. The crossword puzzle is a fun puzzle that you get to figure out for the rest of the pieces to complete the Binweevils Code! Good luck my fellow Weevils!